To fish or not to fish? We hope you enjoy Jason du Pont’s latest video short on midge fishing for wild trout on the Gunpowder River. It might sway you. This entry was posted in video on March 27, 2008 by Theaux Le Gardeur. I witnessed an immature Bald Eagle peering down into one of my favorite pools this morning along the Gunpowder river. Perched on a sturdy Walnut tree amidst a Sycamore grove, she looked intent on fishing and I was envious of her view. Through the dappled light, a raucous crow set upon her and left just as quickly, realizing that she was no hawk. Ferns are starting to make their presence known as their stark green fronds unfold against Fall leaves now going to soil. Further upstream, above the boulder pools Capt. Jeff Lewatowski led two clients this past weekend to trick what he termed, “easily three dozen fish” on tiny dries in the #18-24 range. This week Guide Jason du Pont has been steady at the vise with all manner of embroidery thread and wire. Stop in the shop over the weekend and try some of his wares firsthand-they won’t be here long! Low flows mean that the river will be warming quickly. As far as hatches go, warming temps typically point to a, “hell is…about to break loose” scenario. We have some wonderful Snowshoe Hendrickson emergers that you should not be without this time of year. BWO’s at Masemore, and Blue Quills and Quill Gordons spread out lightly downriver, (where the water is warmer) through Big Falls to Corbett, are also likely suspects this time of year. Early Brown Stoneflies still hanging on to continue their cycle, should give you ample opportunity to “skate.” When midging, wise anglers should stay in the shadows and cast long, fine leaders ending in 7x at the tailouts of riffles. Flow is still at a low, gin clear 39CFs, but should be warming by midday into the high 40’s. Opening day antics downriver should not put a damper on fly fishing in the catch and release or two fish a day stretch so try your luck this fine weekend and shake off some of that cabin fever. Thanks Jason for the advice about midges on Sat. I went out after visiting the store and had a great 3 or 4 hours of casting to rising fish. The action was on and off depending on the breeze and the sun. They seemed to stop rising when the sun was bright and picked up when clouds would roll through. Still even when not rising they were definitely hanging just below the surface. I caught them on a variety of different midges. I think I used every small fly I had in my box. A couple other guys fishing near me were also having a good time with rising fish as well. Used a tandem rig with the putty indicator which i had never used before, I love the stuff, thanks again Jason. Just wanted to say I’m sold on Midge fishing. Anyone who doesn’t want to fish these tiny flies is missing out on excellent fishing right now. This entry was posted in fishing report, news on March 25, 2008 by Theaux Le Gardeur. Our first Eden Cane Rod from Builder Bernard Ramanauskas arrived this week. It is the venerable 704-Y model. 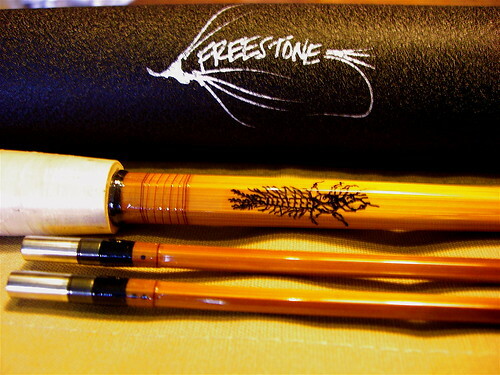 This bamboo fly rod is hollow built, nodeless, and is one of 30 built for the 2008 season. It is a 7ft 4wt 2pc/2 tip rod that is a delight to hold, and is priced at $3, 950. Please call the shop at 410-329-6821 for details…Or, view a brief description online. This entry was posted in gear, reviews on March 14, 2008 by Theaux Le Gardeur. Mild March weather is ideal for dry fly fishing on the Gunpowder. The warm temps hatch clouds of midges and send dark brown stoneflies skittering across the water’s surface. Trout are sipping the midges in the slower pools and whacking larger stoneflies used as searching patterns. Nymphing is still productive, but the surface action has really picked up for anglers willing to tie on some 7X-8X and cast tiny flies to sipping fish. 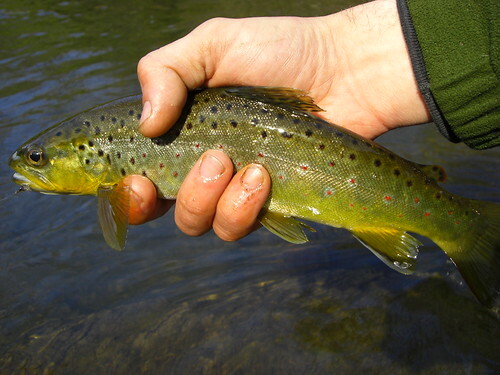 The rising trout tend to go into sporadic feeding cycles, and many fish can be seen hanging inches under the surface. Patience and hatch matching skills will be put to the test in these lower flows, but the fish are feeding on top! I rose over twenty fish on my most recent outing using a variety of small dries and stoneflies. I also filmed crawling stoneflies, hatching midges and egg laying midges, which returned to the water toward evening. This entry was posted in fishing report, video on March 11, 2008 by Jason du Pont. Flyfishing Maryland? Please join us for a Beginners Fly Tying Class on Saturday, April 5, 2008 from 11:00 AM till 2:00PM. It’s an introductory fly tying class that focuses on Gunpowder river fly patterns. One of our Maryland river guides will be teaching this fun-filled beginners class. Cost of the class is $45 per person, and includes the use of tools and materials. The class is limited to six and pre-registration is required. Please give us a call at 410-329-6821 or drop us a line at info@backwaterangler.com to pre-register. This entry was posted in events on March 9, 2008 by Theaux Le Gardeur. 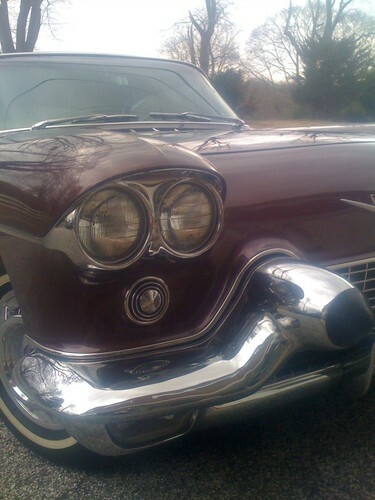 This Caddy pulled into the lot late last week and after talking to the driver for a few minutes about the big beautiful cars’ suicide doors, whitewall tires, and two four barrel carbs, I realized that truly independent fly shops are cut from the same mold as the Eldorado with the stainless steel roof. Backwater Angler has now been on the Monkton scene for seven years. I’d like to thank the Backwater Angler community for their strong support that has made it possible for three full time employees, two part timers and seven guides to work at doing something we love by allowing us to teach stewardship of natural resources through fly fishing. With your support you have all made “the shop steps from the Gunpowder River” a fun and rewarding place to work. I’d also like to personally thank Charlie Gougeon from Maryland Department of Natural Resources and Gene Scarpula from the City of Baltimore, for their comittment to the Gunpowder river. It is through their continued efforts that the resource is thriving. Each week we see fly fisherman from Central Pennsylvania, Delaware, New Jersey, Maryland, Northern Virginia, and D.C. ply the waters of the Gunpowder in search of a little quiet and a few wild fish. The Gunpowder river has 18 miles of public access and this Fall 5, 030 fish per mile were estimated in the upper reaches by the latest fisheries science. We will continue to welcome newcomers to the sport and to the gentleman in the big car, I hope you enjoyed your first visit. This entry was posted in news on March 8, 2008 by Theaux Le Gardeur. Please join us for a flyfishing school. On Sunday, April 6, a Backwater Angler Guide will be teaching a fly fishing school that is ideal for beginners. If you’re planning on fly fishing Maryland, or anywhere else for that matter, this course is a great introduction to the sport. The school covers knots, casting, gear and fly selection. Class is held from 11:00 AM till 2:00 PM. Cost is $100 per person and includes the use of gear. Class size is limited to 4 and pre-registration is required. Please give us a call at 410-329-6821 or drop us a line at info@backwaterangler.com to pre-register. This entry was posted in events on March 8, 2008 by Theaux Le Gardeur. Please join us for a fly fishing school. On Sunday, May 18, a Backwater Angler Guide will be teaching a fly fishing school that is ideal for beginners. If you’re planning on flyfishing Maryland, or anywhere else for that matter, this course is a great introduction to the sport. The school covers knots, casting, gear and fly selection. Class is held from 11:00 AM till 2:00 PM. Cost is $100 per person and includes the use of gear. Class size is limited to 4 and pre-registration is required. Please give us a call at 410-329-6821 or drop us a line at info@backwaterangler.com to pre-register.